In Versailles, at the International Luxury Conference, HP disclosed its latest Spectre 13.3-inch laptop, being the skinniest one in the world. It only weighs 2.45 pounds and at 10.4 mm, the Spectre is as thin as a triple-A battery. The ‘Ash Silver’ hood and body are made of sturdy aluminum. Lightweight carbon fiber makes up its base. 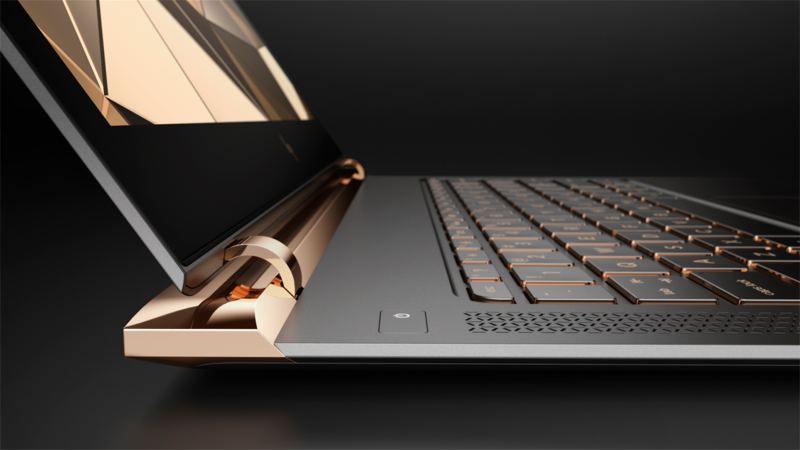 The floating appearance above the keyboard is created by using copper-polished hinge. It is classy and the high-end finishing touches make it look gorgeous. Intel Core i5 and i7 processors with 8 GB RAM power the Spectre laptop. A 13.3-inch Gorilla glass display is full HD resolution (1,920 x 1,080). The IPS display screen is sharp from working distance but lacks the touch screen feature. It has Bang & Olufsen stereo speakers. It provides up to 9 hours and 45 minutes of battery life. To achieve the long life battery goal, it combined four batteries, thus, maximizing every bit of space within the thin frame. It is assumed that, this might be the reason behind not adding the touch screen feature and 4K display option in the laptop which would mean lower battery life. Intel’s hyperbaric cooling system is used for keeping the laptop cool, which means the device uses 2 fans for sucking and redirecting the air over the processor and important components. The Spectre 13.3- inch laptop comes up to 512GB storage in a fast-performing PCIe solid-state drive (SSD). The Spectre 13.3 on the back of the device have three USB Type-C ports, out of them 2 support Thunderbolt 3 speeds as well have 3.5mm headphone jack. Thus, the 3 ports can be utilized to charge the laptop, output video and transfer data. The shiny thin HP laptop cost around $1,249.99 and is available in HP online stores and various leading online websites.